For other uses, see Azov (disambiguation). Azov (Russian: Азов, with the stress on the second syllable), formerly known as Azoff, is a town in Rostov Oblast, Russia, situated on the Don River just 16 kilometers (9.9 mi) from the Sea of Azov, which derives its name from the town. Population: 82,937 (2010 Census); 82,090 (2002 Census); 80,297 (1989 Census). The mouth of the Don River has always been an important commercial center. At the start of the 3rd century BCE, the Greeks from the Bosporan Kingdom founded a colony here, which they called Tanais (after the Greek name of the river). Several centuries later, in the last third of 1st century BCE, the settlement was burned down by king Polemon I of Pontus. The introduction of Greek colonists restored its prosperity, but the Goths practically annihilated it in the 3rd century. The site of ancient Tanais, now occupied by the khutor of Nedvigovka, has been excavated since the mid-19th century. In the 5th century, the area was populated by Karadach's Akatziroi who came under the rule of Dengizich the Hun before Byzantium gave the land to the Hunugurs in the 460s to become known as Patria Onoguria under his brother Ernakh the Hun. The Kutrigur Hun inhabitants of Patria Onoguria became known as the Utigur Bulgars when it became part of the Western Turkic Kaghanate under Sandilch. Then in the 7th century Khan Kubrat ruler of the Unogundurs established Old Great Bolgary there before his heir Batbayan surrendered it to the Khazars. In the 10th century, as the Khazar state disintegrated, the area passed under control of the Slavic princedom of Tmutarakan. The Kipchaks, seizing the area in 1067, renamed it Azaq (i.e., lowlands), from which appellation the modern name is derived. The Golden Horde claimed most of the coast in the 13th and 14th centuries, but the Venetian and Genoese merchants were granted permission to settle on the site of modern-day Azov and founded there a colony which they called Tana (or La Tana). In autumn 2000, Thor Heyerdahl wanted to further investigate his idea that Scandinavians may have migrated from the south via waterways. He was on the trail of Odin (Wotan), the Germanic and Nordic god of the mythologies of the early Norse Eddas and Sagas. According to Snorri Sturluson, the Icelandic author of an Edda and as least one Saga., who wrote in the 13th century, Odin was supposed to have migrated from the region of the Caucasus or the area just east of the Black Sea near the turn of the 1st century CE. Heyerdahl was particularly interested in Snorri's reference to the land of origin of the Æsir people. Heyerdahl wanted to test the veracity of Snorri's claims and as a result organized the Joint Archaeological Excavation in Azov in 2001. He had wanted to undertake a second excavation the following year, but it never happened due to his death in April 2002. In 1471, the Ottoman Empire gained control of the area and built the strong fortress of Azak (Azov). The fort blocked the Don Cossacks from raiding and trading into the Black Sea. The Cossacks had attacked Azov in 1574, 1593, 1620, and 1626. In April 1637, three thousand Don Cossacks and four thousand Zaporozhian Cossacks besieged Azov (the Turks had four thousand soldiers and two hundred cannons). The fort fell on June 21 and the Cossacks sent a request to the Tsar for re-enforcements and support. A commission recommended against this because of the danger of war with Turkey and poor state of the fortifications. In June 1641, Hussein Deli, Pasha of Silistria invested the fort with 70,000–80,000 men. In September, they had to withdraw because of disease and provisioning shortfalls. A second Russian commission reported that the siege had left very little of the walls. In March 1642, Sultan Ibrahim issued an ultimatum and Tsar Mikhail ordered the Cossacks to evacuate. The Turks reoccupied Azov in September 1642. In 1693, the garrison of the fortress was 3,656 of whom 2,272 were Janissaries. The fortress, however, had yet to pass through many vicissitudes. During the Azov campaigns of 1696, Peter the Great, who desired naval access to the Black Sea, managed to recover the fortress. Azov was granted town status in 1708, but the disastrous Pruth River Campaign constrained him to hand it back to the Turks in 1711. A humorous description of the events is featured in Voltaire's Candide. During the Great Russo-Turkish War, it was taken by the army under Count Rumyantsev and finally ceded to Russia under the terms of Treaty of Kuchuk-Kainarji (1774). For seven years Azov was a seat of its own governorate, but with the growth of neighboring Rostov-on-the-Don it gradually declined in importance. It was occupied by the Germans between July 1942 and February 1943 during World War II. Within the framework of administrative divisions, Azov serves as the administrative center of Azovsky District, even though it is not a part of it. As an administrative division, it is incorporated separately as Azov Urban Okrug—an administrative unit with the status equal to that of the districts. As a municipal division, this administrative unit also has urban okrug status. Sergey Bezdolny of the United Russia party was elected Mayor of Azov on April 3, 2005 and re-elected on October 11, 2009 by 72.9% of the voters. The current head of administration (city-manager) Vladimir Rashchupkin holds office from December 2015. Azov's climate is humid continental (Köppen climate classification Dfa), featuring hot summers, cold winters (though quite mild for Russia), and fairly low precipitation. There are many monuments and museums In Azov. Powder cellar in the town of Azov was built in 1799, is the only example of the construction of the fortress of Catherine's time for all of southern Russia (built fortresses Rostov, Taganrog and others completely destroyed), so it is deserved is considered an architectural monument of military engineering art of the 18th century. Wooden cellar served a quarter century, in 1797 he was a dilapidated state was dismantled, and in its place they built a cellar made of stone. In 1799, in the bastion of St. Anne was built a new powder cellar. From the beginning of the 19th to the 20th century the cellar was used for storage of ice. From 1961 to 1965 the cellar was renovated and handed over to historic museum. In 1967, to celebrate the 900 year old Azov soviet officials opened the exposition diorama "The Taking of Azov by the troops of Peter the Great in 1696. The Author of the Diorama - Russian artist Arseny Chernyshov. The Azov Fortress is a fortified complex of Azov overlooking the Don River and the Port of Azov to the north. It includes a rampart, watchtowers and gates. Azov. Monument to the sailors of the Azov Flotilla. 1975. Monument to Peter I is a bronze monument of Peter the Great in the center of Azov. It was designed by sculptors Oleg Komov and Andrey Kovalchuk. The opening ceremony took place on 19 July 1996 and was held in conjunction by the 300-year anniversary of the Russian Navy. Monument to Aleksei Shein is a sculpture of Russian statesman, general, Boyar (from 1695), and the first Russian Generalissimo (1696) Aleksei Semenovich Shein. The monument was opened on June 12, 2009. The authors of the project were M. Lushnikov and V.P. Mokrousov. Monument to the sailors of the Azov Flotilla is dedicated to the Flotilla, which heroically fought in Taganrog Bay and the Don Delta during the Great Patriotic war. The monument is considered to be an object of local cultural heritage. Azov History, Archaeology and Paleontology Museum-Reserve is one of the biggest southern museums of Russia hosting the richest paleontological collection in the South of Russia. The museum was established on 17 May 1917 by Michail Aronovich Makarovskiy. ^ Энциклопедия Города России. Moscow: Большая Российская Энциклопедия. 2003. p. 14. ISBN 5-7107-7399-9. ^ "Russian postal objects – find by name" (in Russian). Archived from the original on September 25, 2009. Retrieved June 7, 2009. ^ Baynes, T.S., ed. (1878). "Azoff" . Encyclopædia Britannica. 3 (9th ed.). New York: Charles Scribner's Sons. p. 169. ^ Lord Kinross, The Ottoman Centuries: The Rise and Fall of the Turkish Empire, Perennial, 1979, p. 353. ISBN 0-688-03093-9. ^ "World Weather Information Service – Azov". United Nations. Retrieved December 31, 2010. ^ "Крепостные валы с Алексеевскими воротами" (in Russian). Ассоциация малых туристских городов. Retrieved 2017-10-01. ^ "Памятники города Азова". www.azovlib.ru (in Russian). Retrieved 2017-02-02. Законодательное Собрание Ростовской области. Закон №234-ЗС от 27 декабря 2004 г. «Об установлении границы и наделении статусом городского округа муниципального образования "Город Азов"». Вступил в силу со дня официального опубликования. Опубликован: "Наше время", №339, 29 декабря 2004 г. (Legislative Assembly of Rostov Oblast. 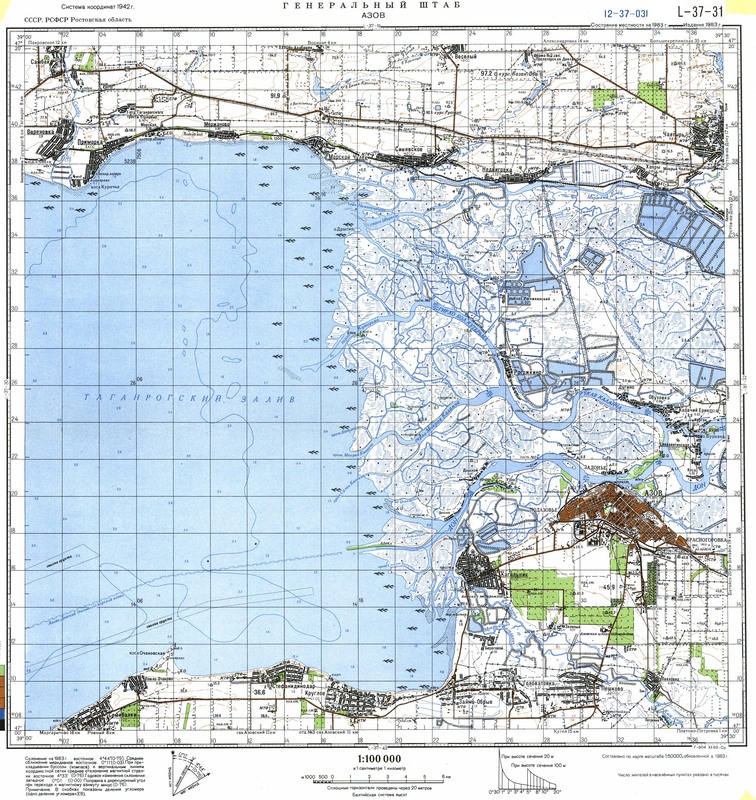 Law #234-ZS of December 27, 2004 On Establishing the Border and Granting Urban Okrug Status to the Municipal Formation of the "Town of Azov". Effective as of the official publication date.). Законодательное Собрание Ростовской области. Закон №239-ЗС от 27 декабря 2004 г. «Об установлении границ и наделении соответствующим статусом муниципального образования "Азовский район" и муниципальных образований в его составе». Вступил в силу с 1 января 2005 г. Опубликован: "Наше время", №339, 29 декабря 2004 г. (Legislative Assembly of Rostov Oblast. Law #239-ZS of December 27, 2004 On Establishing the Borders and Granting an Appropriate Status to the Municipal Formation of "Azovsky District" and to the Municipal Formations It Comprises. Effective as of January 1, 2005.). Wikisource has the text of the 1911 Encyclopædia Britannica article Azov. Konstantinovsky District is an administrative and municipal district (raion), one of the forty-three in Rostov Oblast, Russia. It is located in the center of the oblast. The area of the district is 2,200 square kilometers (850 sq mi). Its administrative center is the town of Konstantinovsk. Population: 33,159 ; 36,595 (2002 Census); 36,741 (1989 Census). The population of Konstantinovsk accounts for 54.1% of the district's total population. Kamensk-Shakhtinsky is a town in Rostov Oblast, located on the Seversky Donets River. Population: 95,296 (2010 Census); 75,632 (2002 Census); 72,379 (1989 Census). Krasny Sulin is a town and the administrative center of Krasnosulinsky District in Rostov Oblast, Russia, located in the Donets Basin region. Population: 40,866 (2010 Census); 44,187 (2002 Census); 43,133 (1989 Census). Aksay is a town and the administrative center of Aksaysky District in Rostov Oblast, Russia, located on the right bank of the Don River, 18 kilometers (11 mi) northeast of Rostov-on-Don, the administrative center of the oblast. Population: 41,969 (2010 Census); 38,012 (2002 Census); 33,389 (1989 Census). It was previously known as Ust-Aksayskaya, Aksayskaya. Tsimlyansk is a town and the administrative center of Tsimlyansky District in Rostov Oblast, Russia, located on the right bank of the Don River, on the coast of Tsimlyansk Reservoir, 236 kilometers (147 mi) northeast of Rostov-on-Don, the administrative center of the oblast. Population: 15,028 (2010 Census); 15,444 (2002 Census); 15,343 (1989 Census). Azovsky District is an administrative and municipal district (raion), one of the forty-three in Rostov Oblast, Russia. It is located in the southwest of the oblast. The area of the district is 2,862 square kilometers (1,105 sq mi). Its administrative center is the town of Azov. Population: 93,579 ; 92,568 (2002 Census); 83,393 (1989 Census). Kamensky District is an administrative and municipal district (raion), one of the forty-three in Rostov Oblast, Russia. It is located in the west of the oblast. The area of the district is 2,570 square kilometers (990 sq mi). Its administrative center is the urban locality of Gluboky. Population: 47,696 ; 51,757 (2002 Census); 53,291 (1989 Census). The population of Gluboky accounts for 20.7% of the district's total population. Kasharsky District is an administrative and municipal district (raion), one of the forty-three in Rostov Oblast, Russia. It is located in the north of the oblast. The area of the district is 3,112 square kilometers (1,202 sq mi). Its administrative center is the rural locality of Kashary. Population: 25,355 ; 27,424 (2002 Census); 29,712 (1989 Census). The population of Kashary accounts for 25.8% of the district's total population. 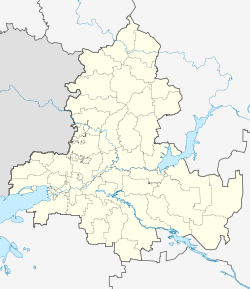 Martynovsky District is an administrative and municipal district (raion), one of the forty-three in Rostov Oblast, Russia. It is located in the center of the oblast. The area of the district is 1,917 square kilometers (740 sq mi). Its administrative center is the rural locality of Bolshaya Martynovka. Population: 36,545 ; 40,499 (2002 Census); 33,684 (1989 Census). The population of Bolshaya Martynovka accounts for 16.9% of the district's total population. Milyutinsky District is an administrative and municipal district (raion), one of the forty-three in Rostov Oblast, Russia. It is located in the northeast of the oblast. The area of the district is 2,116 square kilometers (817 sq mi). Its administrative center is the rural locality of Milyutinskaya. Population: 15,082 ; 17,847 (2002 Census); 19,352 (1989 Census). The population of Milyutinskaya accounts for 16.7% of the district's total population. Morozovsky District is an administrative and municipal district (raion), one of the forty-three in Rostov Oblast, Russia. It is located in the east of the oblast. The area of the district is 2,550 square kilometers (980 sq mi). Its administrative center is the town of Morozovsk. Population: 42,404 ; 46,395 (2002 Census); 43,574 (1989 Census). The population of Morozovsk accounts for 65.2% of the district's total population. Oblivsky District is an administrative and municipal district (raion), one of the forty-three in Rostov Oblast, Russia. It is located in the northeast of the oblast. The area of the district is 2,013.5 square kilometers (777.4 sq mi). Its administrative center is the rural locality of Oblivskaya. Population: 18,872 ; 19,167 (2002 Census); 27,610 (1989 Census). The population of Oblivskaya accounts for 52.5% of the district's total population. Orlovsky District is an administrative and municipal district (raion), one of the forty-three in Rostov Oblast, Russia. It is located in the southeast of the oblast. The area of the district is 3,300 square kilometers (1,300 sq mi). Its administrative center is the rural locality of Orlovsky. Population: 40,894 ; 41,768 (2002 Census); 39,386 (1989 Census). The population of the administrative center accounts for 48.9% of the district's total population. Salsky District is an administrative and municipal district (raion), one of the forty-three in Rostov Oblast, Russia. It is located in the south of the oblast. The area of the district is 3,499 square kilometers (1,351 sq mi). Its administrative center is the town of Salsk. Population: 107,795 ; 49,343 (2002 Census); 45,908 (1989 Census). The population of Salsk accounts for 56.9% of the district's total population. Semikarakorsky District is an administrative and municipal district (raion), one of the forty-three in Rostov Oblast, Russia. It is located in the center of the oblast. The area of the district is 1,402 square kilometers (541 sq mi). Its administrative center is the town of Semikarakorsk. Population: 52,833 ; 54,125 (2002 Census); 52,222 (1989 Census). The population of Semikarakorsk accounts for 45.2% of the district's total population. Tselinsky District is an administrative and municipal district (raion), one of the forty-three in Rostov Oblast, Russia. It is located in the south of the oblast. The area of the district is 2,129 square kilometers (822 sq mi). Its administrative center is the rural locality of Tselina. Population: 33,690 ; 36,742 (2002 Census); 34,666 (1989 Census). The population of Tselina accounts for 31.6% of the district's total population. Tsimlyansky District is an administrative and municipal district (raion), one of the forty-three in Rostov Oblast, Russia. It is located in the east of the oblast. The area of the district is 2,529 square kilometers (976 sq mi). Its administrative center is the town of Tsimlyansk. Population: 34,222 ; 35,998 (2002 Census); 33,851 (1989 Census). The population of Tsimlyansk accounts for 43.9% of the district's total population. Vesyolovsky District is an administrative and municipal district (raion), one of the forty-three in Rostov Oblast, Russia. It is located in the southern central part of the oblast. The area of the district is 1,355 square kilometers (523 sq mi). Its administrative center is the rural locality of Vesyoly. Population: 26,165 ; 26,564 (2002 Census); 23,016 (1989 Census). The population of Vesyoly accounts for 35.1% of the district's total population. Volgodonskoy District is an administrative and municipal district (raion), one of the forty-three in Rostov Oblast, Russia. It is located in the eastern central part of the oblast. The area of the district is 1,479 square kilometers (571 sq mi). Its administrative center is the rural locality of Romanovskaya. Population: 33,779 ; 30,170 (2002 Census); 24,690 (1989 Census). The population of Romanovskaya accounts for 24.4% of the district's total population.